I’ve been getting some emails regarding the mini book challenges and some of you have already completed them – way to go!! But some need a little more time (me included – haha) so since I started them late this month, I’m going to extend this first challenge to the end of September. I will start the next challenge (we’ll just technically skip Sept and call it the October challenge) September 20 – that way you’ll have over a month to get it completed. So please have your current challenge completed by September 29 and I’ll announce the winner on September 30. Now as far as the prizes go for the challenges, this is how it will work: if you complete the challenge, you automatically get 2 entries into the draw. If you just want to enter for the giveaway, then go ahead and leave a comment here for 1 entry. The winner will be selected by random.org. 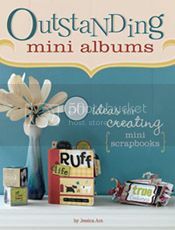 If you don’t mind me posting pictures of your completed mini albums on my blog here, please email me photos when you have completed the challenge. I will post photos of everyone’s albums throughout the month. « My New Life	» Let’s see those mini books! You can post pics of mine if you like. The pics aren’t that great (lighting is bad in our place)but feel free if there’s something you want to show. Cute heart shaped album. I won’t get to play this month, but look forward to Oct’s challenge. This one is so cute Jess! I’m sure you’re probably not finding too much time for scrappin’ these days though!